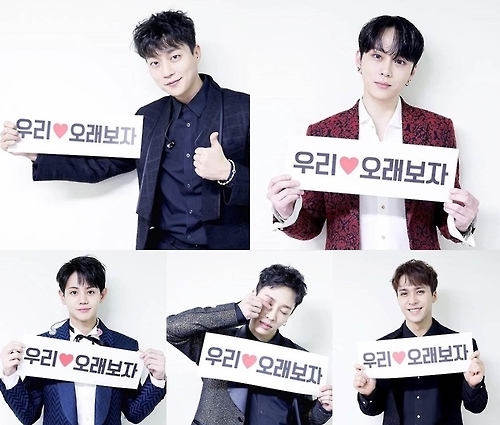 SEOUL, Feb. 25 (Yonhap) — South Korean boy band BEAST will restart its activities with five members under the new name “Highlight,” its management agency said. Around US Entertainment said the group — Yoon Doo-joon, Yong Jun-hyung, Yang Yo-seob, Lee Ki-kwang and Son Dong-woon — will now be known as Highlight, as the use of their former group name became legally impossible. The new name is from the title of BEAST’s latest album “Highlight,” which was the first and only album the band released with the five members under Cube Entertainment. Since its debut in 2009, BEAST became popular at home and in Japan with hit songs “Bad Girl,” “Shock,” “Midnight Sun” and “On Rainy Days.” It started out as a six-member act, but Jang Hyun-seung quit in April and remains signed to Cube. The remaining five signed up with Around US after their contract with Cube expired in October. But they were no longer BEAST, because the former agency has the trademark rights to the name. “We thank fans for tirelessly waiting till the new name is made,” Highlight said in a statement released through its news agency on Friday. Following the announcement, each of Highlight’s members took to social media to thank fans for their support and asked for their continued love under the new name.